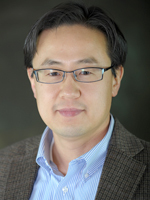 Dr. Han is a Professor in the Departments of Chemical & Biological Engineering and Electrical & Computer Engineering at the University of New Mexico (UNM). He earned his Ph.D. in Chemical Engineering from the University of California at Santa Barbara and his B.S. in Chemical Engineering with Honors from the University of California at Berkeley. Han is a recipient of Air Force Summer Faculty Fellowship in 2012 and 2014; UNM Science and Technology Corporation Creative Award consecutively from 2009 to 2014; UNM School of Engineering Senior Teaching Excellence Award in 2012; UNM Junior Faculty Research Excellence Award in 2005; and NSF Career Award in 2001. Han holds 10 UNM-affiliated issued U.S. patents. He has over 50 publications in peer-reviewed journals and over 150 invited/contributed papers at academic institutions and conferences.